GAELSCOIL Sáirséal is fundraising currently for health and wellbeing training and equipment. As part of this the children of the school partook in a Santa Dash in Shelbourne Park on December 21, raising over €300 in the process. 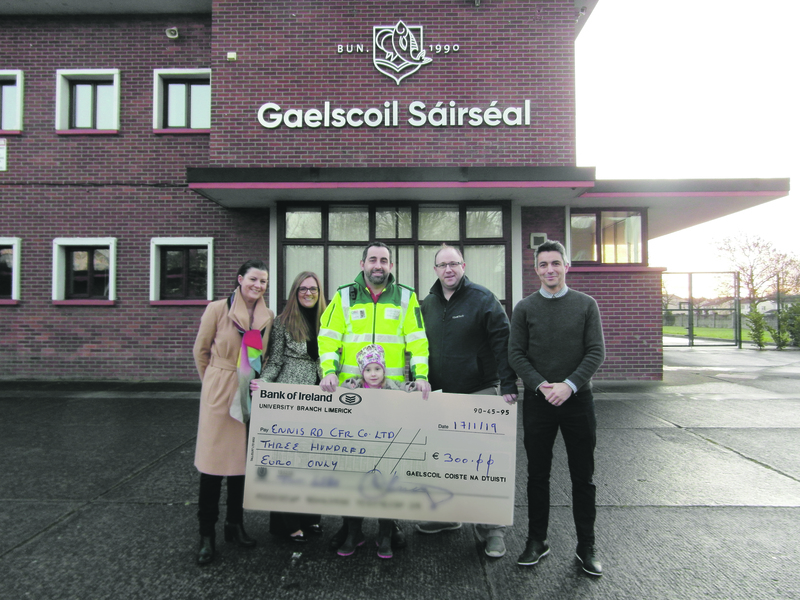 This money has been donated to their local Community First Responders on the Ennis Road, who have volunteered their services kindly in training some staff and children from the school in the area of CPR, choking and first aid. The next phase of Gaelscoil Sáirseal fundraising efforts will be a table quiz, open to all, in Na Piarsaigh clubhouse on February 27 at 8pm. Funds will be put towards the purchase of a defibrillator for the school. The Gaelscoil has been working hard on establishing themselves as part of the community on the northside of the city since moving to their new home on the Shelbourne Road in 2016. They have strong links with many local sports clubs, including Na Piarsaigh, Munster Rugby and Limerick Lawn Tennis Club. However the link with the Community First Responders and acquiring a defibrillator are seen as a very important components in the future wellbeing of the school children and their families.